Russia’s President Vladimir Putin meets with Russian Far Eastern Federal District investors as part of the 2016 Eastern Economic Forum at Far Eastern Federal University on Russky Island, Vladivostok, Russia, on September 2, 2016. In 2015, more than 300 investment projects were launched in the region, which attracted over $15.35 billion in investment. The Russian authorities will set up an international science and education center in Vladivostok with the help of Asian experts, President Vladimir Putin said at a plenary session of the Eastern Economic Forum (EEF) on Sept. 3. “We invite our colleagues in Asia to establish it,” Putin said. Russia plans to set up a platform for technological development and the support of start-ups in its Far Eastern regions. Moscow would like foreign professors and students to be a part of this initiative. 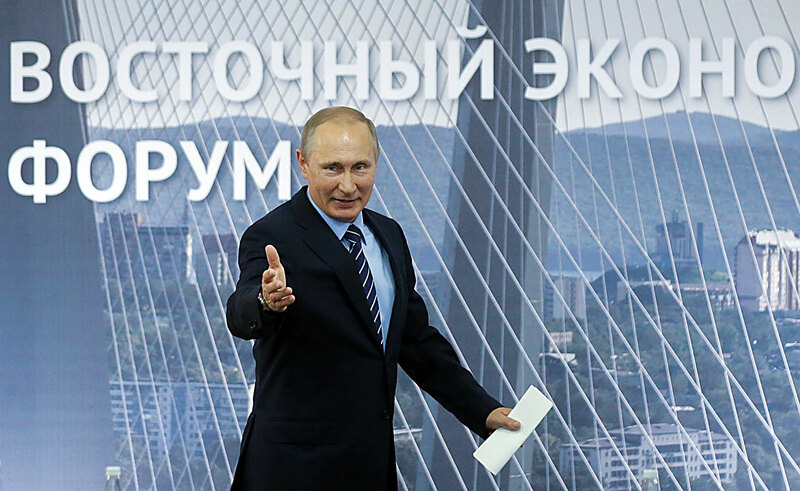 The Far Eastern Federal University (FEFU), which hosted the EEF, already has 2,500 foreign students, Putin said. “We have set ourselves an ambitious and large-scale task – to turn the Far East into a center for the development of our country, a powerful and advanced center.” Putin said. “It is one of our most important national priorities, and we are seeing some encouraging results.” He went on to add that the Russian Far East saw industrial growth of over 5 percent in 2015, whereas in the rest of the country the figure was just 0.3 percent. In 2015, more than 300 investment projects were launched in the region, which attracted over 1 trillion rubles ($15.35 billion) in investment. These figures prove that business is on the upswing in the region, Putin said, adding that the region was witnessing a positive demographic trend. For the first time in 25 years, the population of the Russian Far East grew, and for the third year in a row the birth rate was higher than the mortality rate. In the first six months of 2016, emigration from the region dropped by over 70 percent. “We can take advantage of this trend and make it irreversible,” Putin said. He went on to add that the Russian authorities had created favorable conditions for attracting foreign investors to the Far East. He noted the launch of the free port regime for Vladivostok and Territories of Accelerated Development (TAD), which offer a simplified tax regime and favorable credit conditions for investors. In the near future, the Russian government plans to ease visa requirements for foreign nationals and to start issuing electronic visas, Putin added. The newly launched stock exchange platform called Voskhod (sunrise in Russian) will give international investors access to Russian corporate shares and bonds, Putin said. “A good example of cooperation is the Russian-Chinese agricultural fund, which supports export-oriented projects in the food sector,” he added. The Russian President sees the Russian Far East becoming a supplier of organic food for the Asia-Pacific. The strategy for the development of the Russian Far East is based on openness for cooperation since the region lies at the center of regional integration processes, Putin said. “Together with Eurasian Economic Union colleagues, we are now drawing up wide-ranging proposals for developing integration,” the Russian President said. “They concern lifting trade barriers, supporting commodity flows and protecting intellectual property. Putin added that the Russian authorities support the idea of setting up an energy ring linking Russia to China, South Korea and Mongolia. “We therefore propose forming an intergovernmental working group for creating this ring,” he said. Over 3000 visitors from 35 countries attended the Eastern Economic Forum in Vladivostok. “We see a growing interest from Asia and from other parts of Russia to our Far Eastern agenda and in implementing promising projects in the Far East,” Putin said.